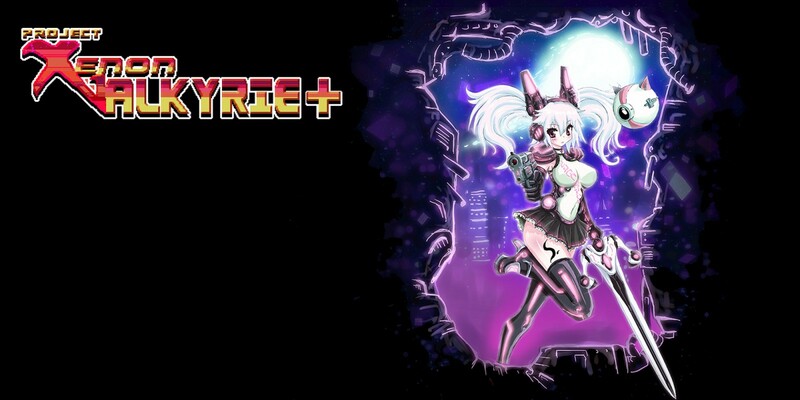 Xenon Valkyrie+ is another entry in the long line of rogue-lite games that have graced the Nintendo Switch, and for fans of the genre, it tries to deliver. You start the game off with a throwaway classic story about wars fought long ago and a new threat to the peace…to which you have been enlisted to help stave off. You get to choose between three different playable characters- Renna-who has the most HP and strength, Eloen with the medium stats, starts with a key, and has unlimited timebombs to blast through the landscape, and Nue, who has low HP, higher defense, the highest amount of ammo, and a high jump that is incredibly useful. You start off with a sword for melee attacks and a gun for ranged. Your gun’s ammo is limited and you cannot use it against the bosses. Although I started off believing that every level was randomly generated, I believe that there are just a large amount of pre-made levels that the game selects for you, depending on the level you happen to be on. The goal of each level is to make your way through in search of a telepad that keeps you moving downward. After completing two such levels, you will be given a randomly selected boss to defeat. If you die, game over, start all over at the beginning. The only thing that carries over to subsequent attempts is teamerite, which can be used to purchase upgrades in a castle next to the hub teleporter. While you can progress more quickly through each level by simply moving down, it is better for you to hunt around the level trying to accumulate wealth and experience points. The experience points will help you earn talent points, which can be spent on upgrades between levels, and the money can be used to purchase one of three randomly generated items. The telepad at the end of each level also awards talent points, so there is a little bit of growth that can happen if you don’t kill any enemies along the way. You will also find weapons upgrades in white coffins as your work your way through, and these require a key to unlock. A level’s miniboss will give you a key if you defeat it, and you can buy them on occasion. A few of the drawbacks I noticed are that the telepad can spawn on spikes. While you can walk behind spikes to avoid damage, if you land on them, you still receive damage. This is troublesome because the telepad seems to sometimes spawn in a pit with spikes underneath. When I contacted the developer about this, I was told that while it is a possibility, you can activate the telepad before you hit the spikes to avoid damage, so go into this game with that knowledge if you ever notice spikes under your telepad. I also experienced a bug where occasionally upon picking up an upgraded sword in level, I would no longer have use of my gun, no matter how much ammo I still had left. Developer was unaware of this issue and began to test for it again. Haven’t heard back yet, but will update when they do. There is no way to recover health points or ammo while in a stage. If you’re near death or out of ammo…you just have to make do. Due to the randomly generated nature of the item selection, you will frequently only get health back by upgrading your HP using any talent points that you have earned in the previous level, but even then, you stay at the same relative level of HP as before you upgraded. Rogue-lites are supposed to be tough games, and they offer you an incentive to keep going back by constantly dangling carrots of more powerful weapons to make the earlier stages even easier…but Xenon Valkyrie+ fails in this regard because even if you manage to unlock bigger and better weapons, you are required to use Teamerite to purchase it, which is possibly the rarest purchasable item spawn in the game based on my own experiences, and it was usually out of my price range when it did show up. Xenon Valkyrie+ does deliver on its nostalgia beats, though, Beautiful sprite work, an amazing chiptune soundtrack (before it becomes repetitive due to constantly replaying the same stages over and over), and a few different screen filters to make it look more retro. You can keep it on original aspect ratio, stretch to full screen, use interpolation, apply a CRT filter that rounds off the corners of the screen (which looks boss when docked, but much too strange in handheld mode), and a second CRT filter that makes the screen look like it has a burning effect (or maybe it’s just trying for that “sitting way too close to the screen” look that makes everything smudged and the colors off?). While the CRT-2 filter is very unappealing to me, there might be some fans of the vaseline screen out there that will be highly entertained by this questionable choice. Overall, Xenon Valkyrie+ is a solid action platformer with solid controls, catchy music, and a very familiar feel for so many old school gamers. However, it descends quickly into frustration when the three playable characters aren’t enough to break up the tedious gameplay when you have to repeat the first and second levels for the dozenth time just to try your hand at the third boss one more time, especially when you don’t even know if you’re going to get that boss you’ve begun to learn so well again. The ability to distribute talent points to your HP, strength, speed and whatever else doesn’t even matter when the only thing worth spending your talent points on is HP just to keep yourself alive. It feels as though Xenon Valkyrie+ wanted to try to be so many things, but didn’t blend them together into a cohesive whole.